FIGHT UPDATES: Danny Garcia defeated Erik Morales via unanimous decision and capture the WBC lightwelterweight belt! Congratulations to the new WBC light welterweight champion Danny Garcia! 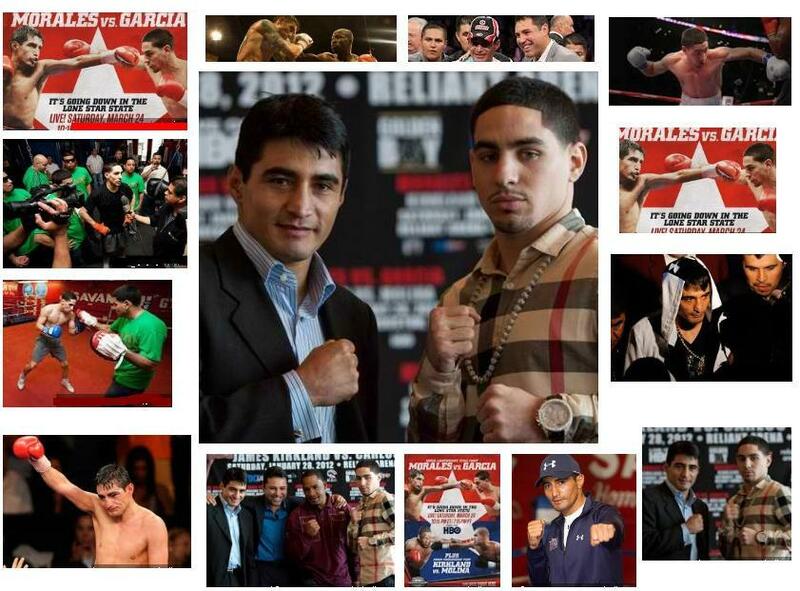 Erik Morales vs Danny Garcia Live on March 24, 2012 in Houston Texas, USA. The much awaited and much anticipated fight of Erik Morales vs Danny Garcia was preciously schedule last January 28, 2012 but the fight was postponed due to Morales committed surgery and that the fight was pulled out. Now, the undisputed match between Erick Morales and Danny Garcia fight will mark the calendar which dated this March 24, 2012 entitle to finish the lone contract for both camp, the Erik "EL Terrible" Morales vs Danny "Swift" Garcia fight live in Houston Texas, USA, where Morales vs Garcia live streaming live on HBO at 10:15 p.m.
Erik Morales, the terrible Mexican legend, with a box record of 52 wins (36 KO's), 7 losses, and 0 draws with a total of 59 professional fights, a man of win or loss record, the first Mexican-born boxer in history to win four world titles in different divisions, and the current WBC Light Welterweight Champion of the world known as "El Terrible" will now position again to show the world of boxing that he is still one of the best boxers in the world even badly but honored beaten by best pound for pound boxer of the world "Manny 'Pacman' Pacquiao", still the Mexican "EL TERRIBLE" Morales deserves in eyes of millions of boxing fans as one of Mexican great, in his greatness of professional boxing. He will now fighting against the much fresher guy with no losses named Danny Garcia. Danny Garcia, a Puerto Rican and American professional boxer with a perfect box record of 22 wins (14 KO's), o losses, and 0 draws, a hungry boxer for a word title, and this would be his first world title contest where he will fighting against the legend, and this man no other than Danny Garcia fighting for Erik Morales and hoping to capture the title from Morales. Watch this Morales vs Garcia fight live streaming, with the fight results of the fight, and who will be emerged as the victor or winner of this fight. Whom do you think will win this fight? Millions of boxing fans around the world are eager to watch the fight even in the full video replay of Morales Vs Garcia fight right after the fight. Let's get to rumble on Morales vs Garcia Fight! Take note, due to overweight committed by Morales during the weigh-in, the organizer decided to impose the following conditions; first if Morales will win this fight, this would be a non-title fight for him, as the belt would be a vacant title belt. Second, if Garcia will win this fight, this would be his first world title belt on his waist. It's now or never! We would like to thank to the site to continually support the boxing fans even in the internet, doing best to deliver the live streaming online to cater the needs of these visitors and boxing fans around the world. However, sometimes, or some other times, the site having a hard time finding the reliable sources for live streaming in the internet as done before especially this Morales VS Garcia live streaming, we hope that the readers and boxing fans out there respects and be patient enough waiting for the live streaming to release on this page even delayed a little bit. As we have done it before, we promise to deliver as much as we can to meet the needs of boxing fans so that the can watch the live streaming online, so, please be patient and be back soon for more updates. Thanks. We do cover round by round updates of the fights, updating the winner of the fight, and displaying here on this page of the complete lists of winners and fight results of Morales vs Garcia fight. Please check back soon. The full video replay of Morales vs Garcia will be embedded here on this page after the fight. It would be on delayed of hours or even days to post the Morales VS Garcia fight video replay. So, please be patient.